Slogan cancellations: Send Birthday Greetings. 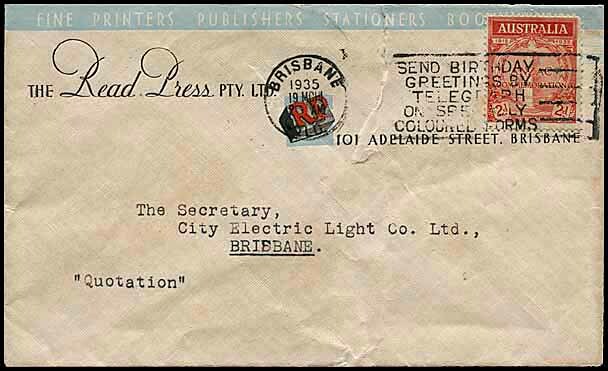 was introduced at all main Post Offices except Perth during the week commencing 13 February 1934. 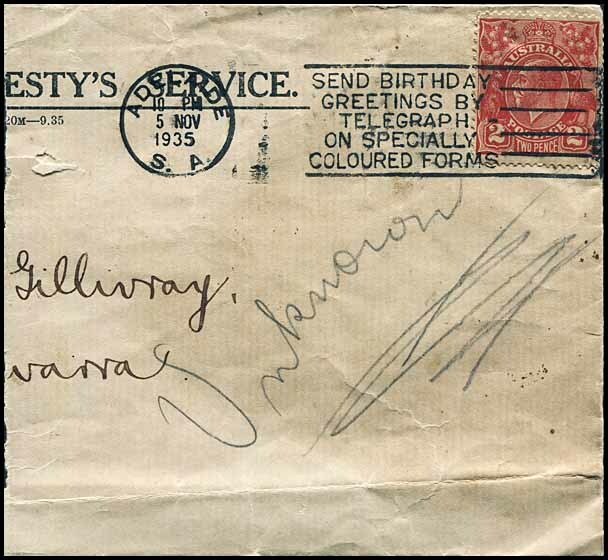 The first format of the Birthday Greetings telegram was probably first issued on 23 September 1934 although an official statement indicated the issue date was 5 November 1934. 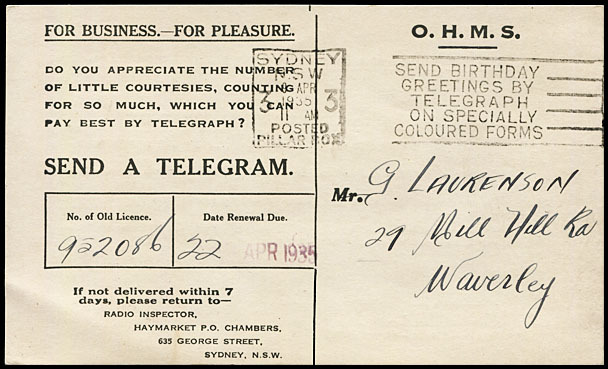 The second format of the Birthday Greetings telegram was issued in 1939 with a smaller war-time economy size being issued in late 1941 and withdrawn during 1942.
to 26 August 1941 at Brisbane and Sydney (4 examples in the Census). The slogan was gradually withdrawn from use - along with all other slogans - starting in the first half of 1940 although a number of 1941 uses are known - especially at Brisbane and Sydney. The postmark was made from chrome steel. It was 20 mm high and 52 mm wide. 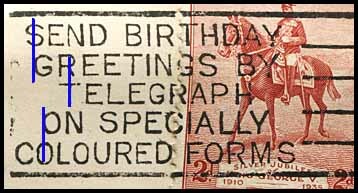 The Send Birthday Greetings ... slogan appears to be the most inconsistently made slogan of all 11 slogans related to advertising the telegram and telegraph services. Certainly there are the usual variations in terms of shape of date stamp, type and number of box and the inscriptions at the top and base of the date stamp. In addition, they also vary in letter positions and length of lines within and between Offices and across years in many ways which have no consistency - except perhaps for a lack of specification and quality control during the setting process. Sydney is perhaps the Office where most variations occurred and questions must be raised about why the realignment of letters occurred over such short periods. There are also several examples of dies wearing and not printing all letters as intended. No precise classification is therefore possible for this slogan as was possible for the other slogans. It must therefore be a broad classification with sub groups but which still contains variations. Secondary classification: the relative starting positions (i.e. on the left) for the letters R, T and N in the next three lines. Die 1: The G (of GREETINGS) is slightly outdented from the S (of SEND). the line with C (of COLOURED) is outdented more than the other lines and hence, in lines 4 and 5, the O (of ON) and the O (of COLOURED) are not aligned. This is an Adelaide Die. 10 August 1939 at Adelaide Box 4. The G (of GREETINGS) is approximately level with the S (of SEND). the O (of ON) is approximately aligned with the C (of COLOURED) below. This die has a wide G for TELEGRAPH in Hobart but not in Melbourne. 27 July 1938 at Hobart (circle). the O (of ON) extends beyond the C (of COLOURED) below. This is a Brisbane die. 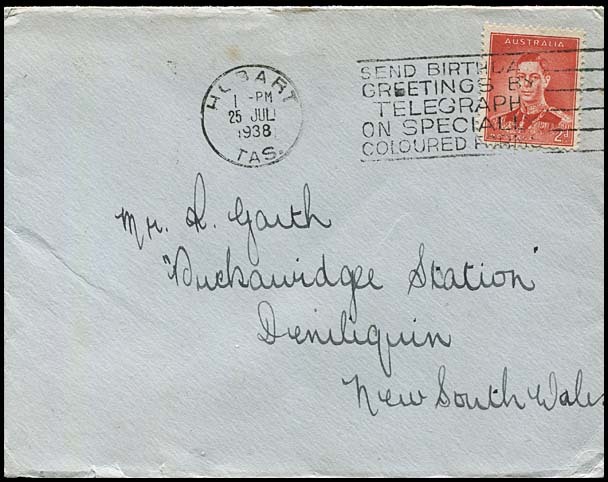 26 August 1941 with Brisbane Country Box 5 date stamp. the C (of COLOURED) is significantly outdented. the O (of COLOURED) below. 19 June 1941 with Sydney 8 Box NSW AUST date stamp. the S (of SEND) has about half a letter overlap with the G (of GREETINGS). the O (of ON) is above the CO (of COLOURED). 29 October 1937 with a Brisbane 2 POSTED PILLARS. The T (of TELEGRAM) is level with or to the left of the R (of GREETINGS). 18 May 1938 at Sydney Pillar Box 1. 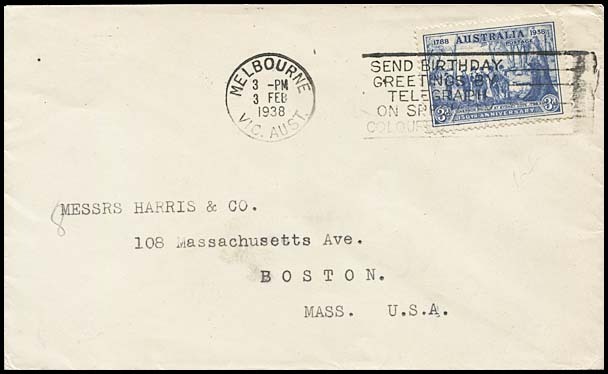 9 April 1935 at Sydney Pillar Box 3. 21 August 1941 at Brisbane Pillars 7. 17 June 1941 at Sydney NSW Aust 9. The upright from the T (of TELEGRAM) is under the right side of R (of GREETINGS). the O (of ON) is above the O (of COLOURED). The N (OF on) starts just after the L below and finishes at the start of the 2nd O. 5 November 1935 at Adelaide (circle). The N (of ON) starts well after the L and finishes about the middle of the 2nd O. 16 August 1935 at Sydney IN PILLAR BOX 1. Earliest recorded date: 8 May 1935. Latest recorded date: 30 June 1941. A progressive error occurred to one of the circle dies in late February 1936. Earliest recorded date: 19 March 1935. Latest recorded date: 26 August 1941. Earliest recorded date: 5 July 1937. Latest recorded date: 27 July 1938. Earliest recorded date: 15 July 1937. Latest recorded date: 1 November 1940. Earliest recorded date: 5 September 1934. Latest recorded date: 28 August 1941. On a card for a Radio Licence renewal.